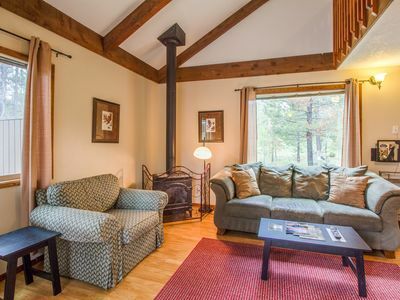 Rest and relax at Sunny Pine Lodge, where you will find all the comforts of home in a tranquil wooded setting. 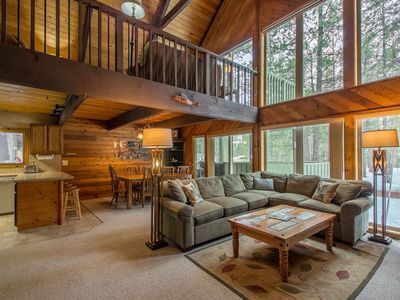 Take pleasure in this home’s rustic cabin feel while still enjoying spacious rooms and luxuries to satisfy your not-so-rustic needs. 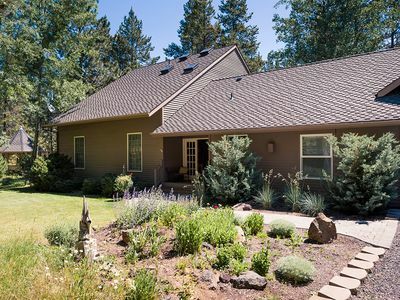 You will find that Sunny Pine Lodge is not located in a crowded development, but rather is situated on over an acre of wooded land left partially unfenced to allow the many deer who call Deschutes River Woods “home” to visit the yard, and to bring you a little closer to nature. 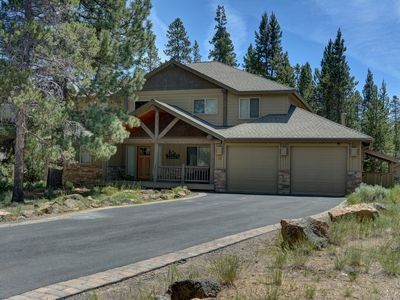 While Deschutes River is not accessible from the home (steep cliff lined with homes on private property), you can hear the river rushing from the front yard. 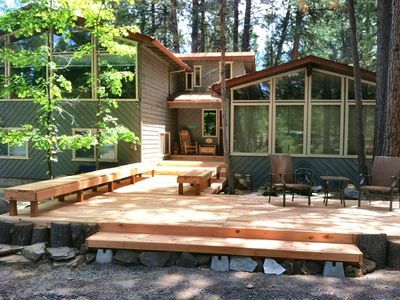 You will be able to read your favorite book in the front porch rocking chair while enjoying the sun and listening to the river, birds, and squirrels, or savor your morning coffee under the pines while watching for deer from the cobblestone patio. 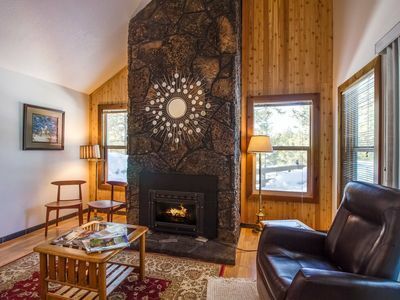 This quiet cabin in the woods offers many other amenities as well, such as a six-person hot-tub, fireplace, wood stove, indoor fountain, and game room complete with pool table, foosball, and dart board. Looking for a little entertainment while you’re here? 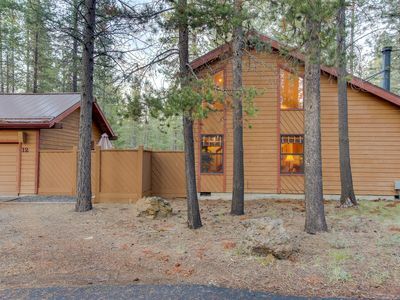 Stroll through the shops in Downtown Bend and The Old Mill District, check out a few of the local breweries, or even catch a show at the Les Schwab Amphitheater – all are located within 10 minutes’ drive, but allow you to quickly return to quiet tranquility of Sunny Pine Lodge. Looking for something a little more adventurous? 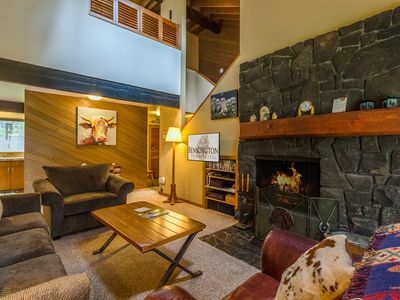 You can be on the slopes of Mt.Bachelor in a mere 30 minutes! 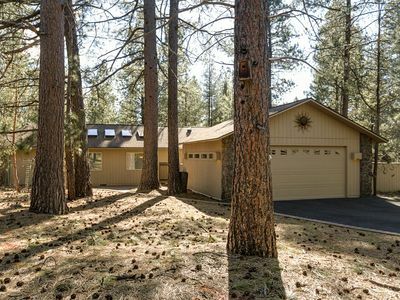 You’ll also find Sun river, Lava Lands, and the Lava River Caves only 20 minutes away. Got kids? You can be at The High Desert Museum in only 10 minutes! 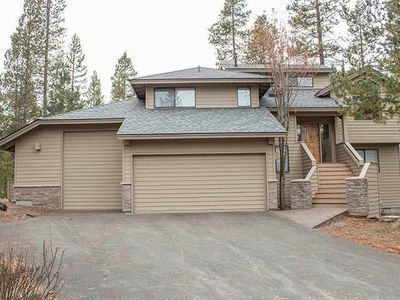 HOUSE LAYOUT: this wonderful home is split among 3 levels. 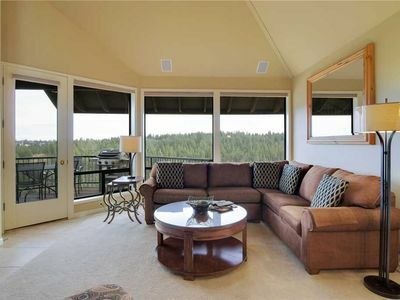 * Gourmet kitchen with granite counters, stainless appliances and deck with stainless steel gas grill. 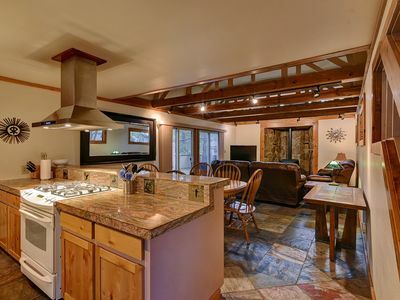 * Dining room with seating for 8 at the large table, plus two additional chairs at the bar. 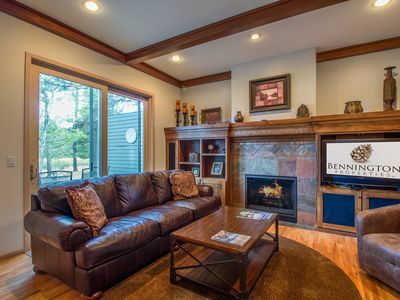 * Living room is spacious and comfortable with a large fireplace, sectional sofa, leather recliner, indoor fountain, and a 46” flat screen HDTV. 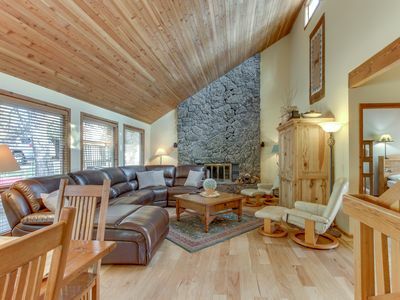 * Master bedroom is extremely spacious with a flat screen TV, king size memory foam mattress and full en-suite bathroom with dual sinks and stand-up shower. 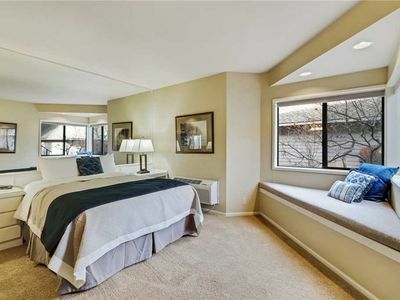 This bedroom also has a private entrance to the sun patio and hot tub. 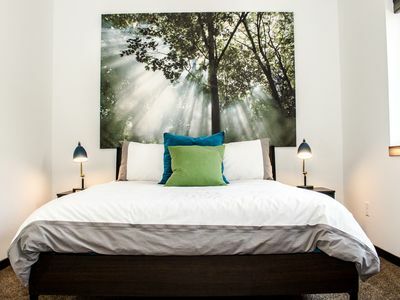 * Queen bedroom boasts pine walls and also has a memory foam mattress. * Bunk room has two sets of custom made pine bunk beds. Great for kids or adults! *Game Room features full size newer pool table, foosball table, dart board, full sized futon (sleeps 2), and 40” LCD flat screen TV. 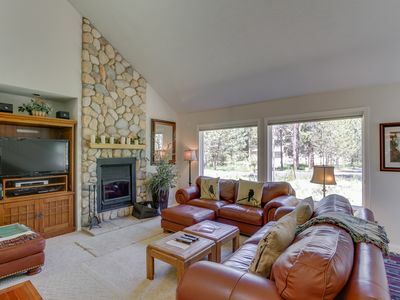 *Den with a wood stove and rich leather seating. 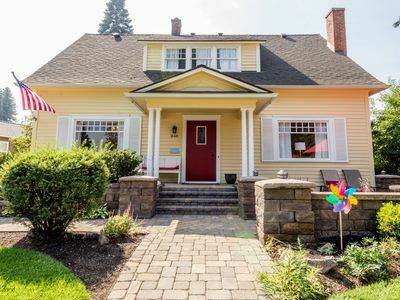 *Door to covered patio and spacious backyard. 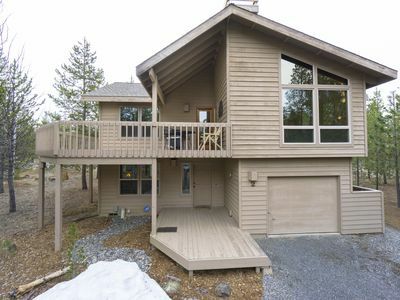 Charming house w/ private hot tub, bikes, and eight SHARC passes!